Well, I’ve always been into adventure sports, especially trekking and rafting, and as a Ladakhi, I am pretty familiar with the treks in and around this region. But I’m not a hard-core adventurer and had never really pushed myself on the endurance front. That apart, Siachen has always been this hugely mythologized place for us. It’s right in our backyard. Yet very few Ladakhis have had the opportunity to go there. We’ve always heard a lot about it from the locals who work with the army as porters and from members of the Ladakh Scouts (a regiment entirely composed of native Ladakhis),but it has been out of bounds since the conflict erupted way back in the 1980s. This was a good opportunity to fulfil two ambitions. How did you sign up for the trek? Once I heard that the Army would be organizing a second trek to the glacier, I represented myself as a prominent citizen of Ladakh. I think they wanted to have a mixed group—the final team of 32 included DRDO (Defence Research and Development Organisation) scientists, members of the media, defence personnel, school students—and I guess my trekking experience helped. The entire trek was sponsored by the Army. Did it call for any special prep on your part? Well, the acclimatization would be the hardest part for anyone, but as a local I didn’t have any issues. I actually joined the rest of the group two days after they arrived in Leh. All expedition members were subject to rigorous physical exams, ranging from blood pressure tests, dental check-ups, oxygen saturation, to physical check-ups, even ECGs for those above the age of 40. Though the tests were routine, they were conducted daily and were a bit irritating, but I think they were necessary. The average of the readings signalled the all-clear for all trek aspirants. Siachen base camp at 14,000ft, a 10-hour drive. This is when the trek was officially flagged off. The road is fantastic—it passes through Khardung La, and winds past the glacier-fed rivers Shyok and Nubra, through villages such as Sumur, Tiger, Panamik, Sasoma, etc. Though I’m a local, I’d never had occasion to come so far, so it was quite a revelation for me as well. 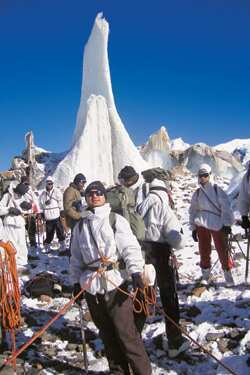 The Siachen trek can be done only under the aegis of the Indian Army. Civilians need to be associated with the various mountaineering and trekking clubs affiliated to the Indian Mountaineering Federation (www.indmount.org) or be direct members of the federation to be invited for the trek. The training basically constituted of familiarizing ourselves with the equipment, which is what every soldier going up the glacier gets. Each of us received a two-layered sleeping bag, Scarpa boots, snow goggles, balaclava, windcheaters, thermal innerwear, down jackets, gloves, ice axe, crampons, rucksack, water bottles, thermos flasks, mattress, sling rope, carabiner and a plate, cup and spoon. We practised ice-climbs using crampons and ice-axes, walked across crevasses over makeshift ladders and, most important, got used to wearing the heavy boots. And then, of course, we acquainted ourselves with the presiding deity of Siachen, O.P. Baba. It’s believed that O.P. was a soldier who died while fighting enemy troops back in the 1980s, but still keeps a benevolent eye on Indian soldiers. So deep is the belief in O.P. Baba that a shrine was built in his honour at the base camp a few years ago. From base camp onwards, every Siachen-bound soldier gives up non-vegetarian food and alcohol and stops shaving and trimming hair. Some of it may be born of necessity but quite a lot of it has to do with faith. And your first sight of the glacier? What was that like? Well, I’d somehow imagined the glacier to be this great white mass, so I was quite surprised to encounter mostly moraines. The actual glacier, I believe, starts after Kumar Camp which, at 16,000ft—halfway up the glacier—was our goal. That apart, what made this trek completely unique was the starkness of the landscape. Unlike other routes, there are no villages, no people anywhere except the group you are travelling with. It’s completely desolate. And the going was tough, especially on the glacial debris—maybe it was on account of the boots, since walking on ice was much easier. How many days did you actually spend on the glacier? What were the temperatures like? We spent eight days on the actual trek. About four or five people were roped into groups so we could walk only at a certain speed and in a straight line. Not easy, especially when you’re lugging rucksacks weighing around 15kg in temperatures of -25 degrees Celsius. The thin air and the gushing wind made the task even more challenging. On an average, we walked for 7-9 hours going up and 6-8 hours on the way down, when we had a better idea of distances and capabilities and had learnt to pace ourselves better. The landscape, I’d say, was not difficult: The training more than prepared us for it. There were plenty of crevasses, deep and wide, but because this path is in constant use, there were ladders and planks bridging the gap. I didn’t find it scary at all. But the panorama is something else altogether: I don’t know if there’s any other point in India from where you see such a large cluster of high peaks in a relatively small area. This is potentially mountaineering heaven: The base camp, if ever opened up, would allow access to several of the most challenging peaks in the Karakoram. That said, we were lucky to have food prepared for us by the troops and porters stationed at each of the three camps. We spent the nights in semi-Arctic tents, five or seven people in each tent to stay warm, and woke up to bed tea at 5am, breakfast at 6am and departure an hour later. But I believe you had to stop short of the actual target because of bad weather. That’s right. The 98km round trip was broken up into stretches of 11km, 13km, 12km and 13km (and the reverse on the way back). But we were stranded for two days at Camp 2 because of bad weather, so we already knew in our hearts that we wouldn’t make it to Kumar Camp. Still, we pushed on to Camp 3, one day short of Kumar. We could have gone on to Kumar, but then we’d have had to cover two days of the trek in one on the way back. In view of the overall situation, we decided to turn back from Camp 3. No regrets…if we didn’t make it to the final goal, it wasn’t because of our inabilities, but because nature willed otherwise.